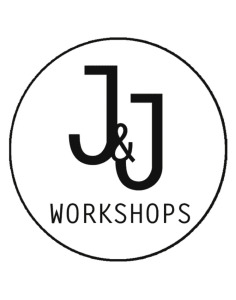 J & J Workshops are run by Jordanne and Jodie, who met whilst studying Material Practice together at Brighton University. 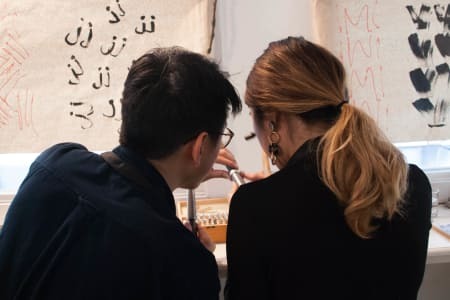 In running their jewellery-making classes, J & J provide a relaxed and supportive environment in which students can explore their creative side, whilst also tapping into a brand new skills base. 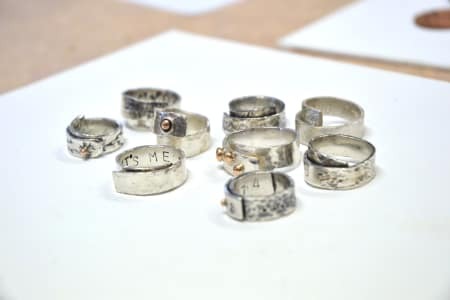 Students leave the workshop with their own piece of silver jewellery that has been designed, crafted and finished by hand. Jordanne and Jodie love seeing students surprise themselves with how professional their outcomes are. 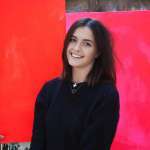 Typically the workshops are run from from Jordanne's Warehouse Studio in Battersea. What a lovely place for a workshop and it's a great gift idea for xmas. Really great way to spend an afternoon. It was interesting to see how a ring is made then giving it a go myself. Jordanne is a great teacher and was very passionate about the different ideas we had. Would recommend to everyone. we had a really good time! 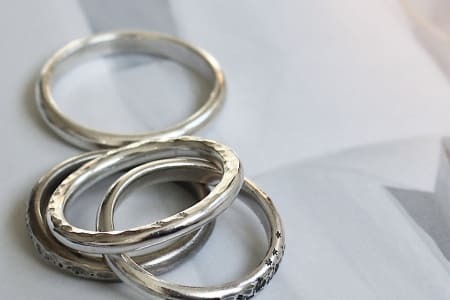 i would definatly recommend this workshop to anyone who's interested in making some silver works/ rings. Second time I have done this class and would recommend it to anyone and everyone. Great teachers, great location and in 2 hours you’ve got a priceless piece of jewellery. Can’t wait for my 3rd class! What a great night! I am so proud of my ring and knowing that I made it from beginning to end! There is no better feeling. Great way to spend an evening - fun chat, lots of new skills and I couldn't be more pleased with the ring I made. The range of marks and design possibilities meant I could make something really personalised, and I'll genuinely be wearing it all the time! The studio was really cool and Jordanne was a lovely teacher - thanks! My friends and I had an amazing time at the workshop. The tuition was excellent, the venue was easy to locate and had everything we needed provided - even a cup of tea! We even stayed a bit later to finish. Thankyou so much and we are definitely interested in doing this again. I had a lot of fun! The process is really interesting and the teacher is really nice! Plus the studio is very sweet. I hundred percent recommend! I feel inspired! Brilliant! Had a great time, so relaxing and a great atmosphere! Made some lovely decorations and i'm going to book again for another evening to make some more! Would highly recommend! Another great evening! 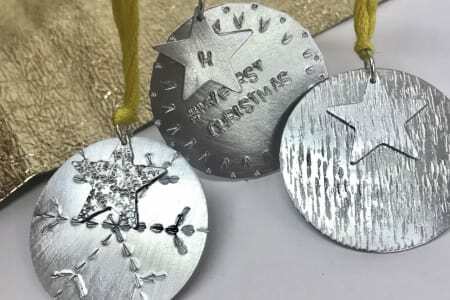 Perfect for making personalised decorations for my tree and gift tags for presents, I’m so pleased with my finished pieces and will be booking again! How to make patterns out of such simple stamps and how making something yourself is so much more than buying it from a high st shop. Jordanne is an excellent teacher. She clearly loves her craft and wants to share her knowledge and experience with others. Jordanne is friendly, patient and very encouraging. My daughter and I thoroughly enjoyed the day and love our wrap rings! I had a great time with Jordanne at this group workshop. 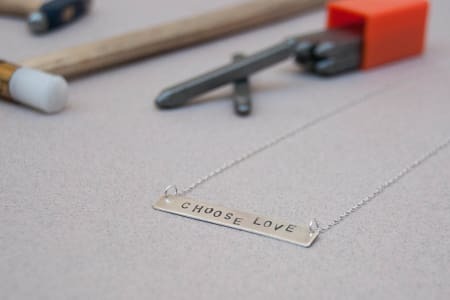 The studio was wonderfully set up with everything we needed to create our pendants. Jordanne explained the processes & techniques very clearly & was there at every step to make sure that we were making good progress & enjoying the workshop. 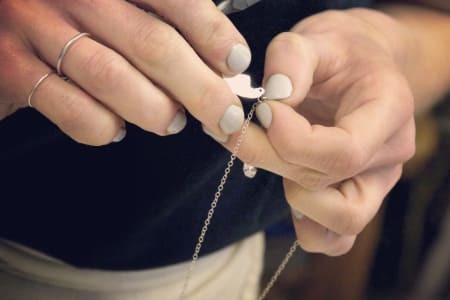 Everyone created an individual pendant necklace. I’d recommend this to any age as it’s a fun day for all! Thank you! Me and two friends had a brilliant day at the silver earring workshop. The whole day was really well planned out, relaxing and enjoyable. Best of all we all ended up with lovely earrings with a great story attached. We went in as complete beginners having never done a course like this before and had no problems with someone always on hand to help if we needed anything. I would definitely recommend! Not only did I come away with a gorgeous pair of earrings, but I had such a good day. I did the class with several friends so it was a great opportunity to catch up with them and learn something new along the way. Jordanne and Jody were so lovely too so it was great to get to know them as well. They had everything we needed to make the earrings and were really helpful in getting us to tap into our creative side! Lots and king forward to making more jewellery with them in the future! 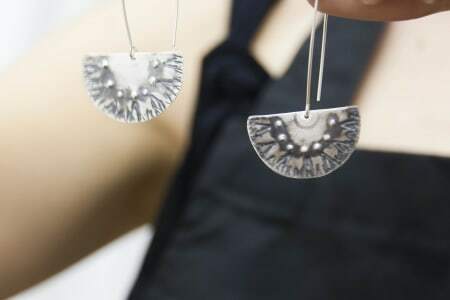 I took part in a fantastic earring making workshop where we learnt how to cut the silver and manipulate it with special tools. The teachers were really helpful and I loved the end product.